The stunningly situated three-bedroom Villa Kailasha rests upon almost 11,000 square metres of beachside land in Bali’s fertile Tabanan regency. The view of the ocean and the glistening black-sand beach just beyond the villa’s coconut grove garden is magnificent, creating a relaxed setting for family holidays and an idyllic backdrop for unforgettable weddings and special events. Villa Kailasha is entered via a porte cochere from a spacious private parking area. 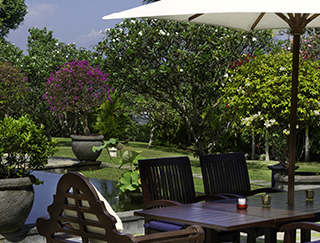 Separate open-sided living and dining pavilions look out over water features, paved pathways and an immaculate lawn. Hidden in the gardens to the left of the living pavilion, the single-storey guesthouse presents two almost-identical bedrooms with ensuite bathrooms. To the far right of the villa grounds, the secluded single-storey master suite comprises a bedroom, bathroom, dressing areas, and private plunge pool with sun deck and balé pavilion. The 14-metre infinity-edge swimming pool, poolside balé and yoga deck, are positioned on the garden’s seaward side to maximise the ocean view.